Reddick sends them packin, but they’ll be back. Do not be beguiled by the Sox 10 -2 record against the Yankees this season. The Baseball Gods do not care what you did yesterday, or how bad you looked in your last 4 at bats. Heading into this weekend’s 3-game series w NY at Fenway, I was willing to settle for 1 of 3. And I prayed to take 2. Lester vs. Colon on Friday. Shellackey vs. Sabathia on Saturday. Beckett vs. Garcia on Sunday. Prayers or not, the Sox are seriously flawed in starting pitching. Beyond Beckett & Lester, we have a 45-year-old knuckler who is effective half the time, a baffled 33 year old former ace with a 6.15 ERA, and a rehabbed new arrival that yielded 5 ER in 5 IP in his first start. Wake, Shellackey and Bedard. The elderly, the confused and the infirmed. That’s our #3 through #5. The Yankees rotation is shaky after Sabathia , Garcia and Colon. But Hughes and Nova can be solid. And erratic A.J. Burnett is a Red Sox fan’s dream. Both teams can score. Both bullpens are deep. The Yankees edge in starting pitching could be the difference maker in determining the Division winner. And make no mistake about the fact that the Nation wants to deny the Yankees the Division. Dreams of humbling the Yankees aside, one has to acknowledge the New York advantage in starting pitching. Heading into Friday night’s game 1, I felt we could win with Beckett & Lester and a Saturday loss was a sure thing with Lackey on the mound. Didn’t happen exactly that way. Friday night’s loss was confounding, marked by the sudden appearance of the impotent Sox, a rare sight this summer. Lester provided a quality start but Colon was better & the NY bullpen shut out the Sox for 4.1 IP. Down we go, 3 – 2. Saturday’s win was unexpected. Lackey came within one out of a quality start, allowing 4 runs, 3 of them earned, in 5.2 IP’s. But Sabathia, he of the 16 – 2 record versus the rest of the AL, was hammered by the Sox for the third time this season, giving up 7 runs in 6 IP’s. Sox 10, Yankees 4. Sunday’s game had the same tempo as Friday’s low scoring affair. Beckett was dominating, leaving with the game tied at 1 -1 after 6 innings. But Matt Albers allowed Brett Gardner (who homers once every 100 plate appearances) to deposit a 390 foot shot into the Boston bullpen in the 7th, making it 2 -1 New York. 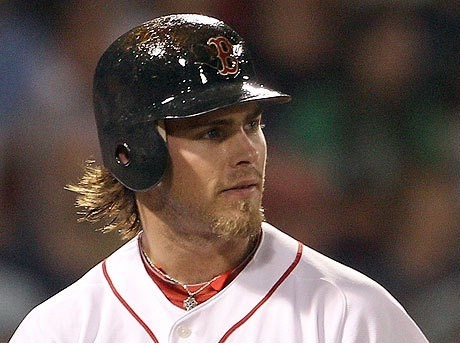 The Sox stranded Crawford at 3rd in the 8th. Papelbon then blanked the Bombers in the 9th, stranding Gardner at 2nd base. It was crunch time. Yankees 2, Sox 1. Heading to the bottom of the 9th. Surely these Sox, with the #1 offense in the AL, could score in the bottom of the 9th to tie it. But here comes the Yankee closer, 12x All Star, 5x World Champion, 642 career saves in his pocket, oh yeah, it’s Mariano in to face Scutaro, Ellsbury & Gonzalez. Crap. Crazy things started to happen. Scutaro skies a 2-2 cutter 70 feet high and it rattles high off the monster on its declining arc. Double. Then, Ells drops a perfect bunt and advances Scutaro to 3rd, almost beating Mo’s throw to first for a single. Pedey steps in. Mo fires an inside strike which the ump calls a ball. The Little Man then clocks Rivera’s next offering on the line to Gardner in left and Scutaro beats the throw to the plate by 8 feet. Adrian Gonzales grounds out, 6 – 3. Score tied, 2 – 2. Extra innings. Top of the 10th. Bard K’s Tex. Bard breaks Cano’s bat & grounds him out, 4-3. Bard strikes out Swisher looking on an 83 mph curve that drops over the outside corner. Here comes Youk, Ortiz and Crawford. Bottom of the 10th. Hughes pitching. Youk flies to Granderson. Papi gets around on a 2 -2 heater and smashes it on 1 hop into the right field grandstand for a double. Darnell McDonald pinch running. Hughes intentionally walks Crawford. Up steps Reddick. Reddick is 0 for 4 this night, having been fooled by Garcia’s variable speeds all night. But his skid ends suddenly. Josh lines Hughes first pitch down the left field line in fair territory, the ball scooting for the wall. McDonald scores easily. Good guys win. Dirty Water plays. The Sox do in fact take two of three. The weekend brings us no closer to determining a winner, really. The team with the $160 million payroll is 1 game ahead of the team with the $210 million payroll — with 50+ games left to be played. But one thing we have learned is that these two teams are well matched. Two of the three games were decided by 1 run. Baseball: Loved by All. Invented by No one in particular. It’s amazing how the Doubleday myth lingers. I was watching an episode of PBS’ Antique Road Show on which an expert mentioned in passing that Abner Doubleday invented Base Ball. My mouth dropped open. My cheesy hot pocket hit the floor. How can anyone living in post-1913 America credit Doubleday ? Abner was named the pastime’s inventor in 1903. He was roundly discredited within a decade. One thing John Thorn acknowledges in his new book, BASEBALL IN THE GARDEN OF EDEN”, is that the Doubleday myth has been hard to kill. Doubleday, a West Point grad and the hero of the siege of Fort Sumter during the Civil War, was credited with creating our game in Cooperstown in 1839. The “evidence” was the detailed memory of a 73 year old man, Abner Graves, who was 5 years old in 1839. Graves later endured emotional challenges to put it politely, murdered his wife and spent his last years in an Asylum. When Abner Graves came out of nowhere in 1903 to spin his yarn it didn’t take long for historians to present evidence to the contrary. Doubleday was at West Point, not Cooperstown, in 1839. Doubleday never spoke of any involvement in the creation of the sport. Doubleday was never spoken of by early practitioners of the game, e.g., the Knickerbockers. One of the Knicks, Alexander Cartwright, never spoke of Doubleday and that is significant given that Cartwright codified the game. Still, the origins of Base Ball are unclear. What do we know? We know Base Ball resembles Rounders and Cricket. We know that Cartwright codified it and that the Knicks and others played it as an intramural exercise in the 1840’s. But we don’t really know how it started. 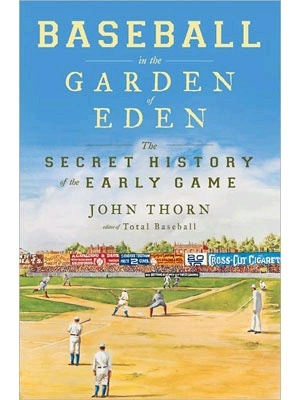 GARDEN OF EDEN goes deep in an effort to trace Base Ball’s origins. Citing newspapers, magazines, and books dating back 250 years, Thorn pieces together a history that obligingly recognizes that the full story may never be known. Thorn achieves great clarity and depth through research he began 28 years ago. He traces Base Ball back to the 1700’s and then moves forward, showing that a colonial girl’s game evolved into one played by adult male-only exercise clubs in the 1830’s, into an extramural team game competed by amateurs in the 1850’s, into a professional team game in the 1860’s, into a professional game with organized leagues in the 1870’s, into a mania that gripped everyone in the 1880’s, into a corrupt monopoly in the 1890’s, and into a ship made right in the early 1900’s. The names could fill a Pantheon. Cartwright. Spalding. Wright. Kelly. Mills. Speaking of Pantheons and other uncommon words Thorn sent me to the dictionary regularly. I have a pretty good vocabulary but I wouldn’t pass a quiz on some of the words in his vocabulary including aver, theosophy, repine, nugatory and faux-naif. Faux-naif is pronounced foh-nah-eef, which by the way means “marked by a pretense of simplicity or innocence”. The Brooklyn Bridegrooms were named as such because of the several newlywed players on the roster. Didn’t know that. William C. Temple, industrial baron who was part owner of the Pirates was the first to come up with the idea of the Designated Hitter back in 1891. The NL killed his idea by a 7-5 vote. Lou Criger, catcher on the 1903 Red Sox, was offered $12,000 to throw the World Series. Criger, whose salary was $4,000 that year, reported the would-be fixer. The Beantowner was rewarded by the owners with a lifetime pension after baseball, a benefit that no other player would be offered for decades. Sunday Base Ball remained illegal in New York City until 1919, in Boston until 1929, and in Philly until 1934. The early famous baseball teams, The Mutuals, Atlantics, Excelsiors and Knicks played only intramural games. They would get together in the late afternoon, warm up, and divide into two squads and play themselves. This went on for years before they began to play the occasional game against another team. A notable game was played in 1883 Philly in which the Snorkey Club played the Hoppers. The Snorkeys were all one armed while the Hoppers were all one legged. All of the players on both clubs were the former employees of the Pennsylvania Railroad Company. Chowder was served regularly at Knickerbocker games in the 1840’s and 50’s. Ingredients included fish, shellfish, sausage and potatoes. A little Ball, a little brew, and a mug of chowder. Mmm Mmm good. It all gets back to food for some of us. Don’t miss this important book. Thorn is the MLB’s Official Historian and a scholar. You may not fly through this book because it thick with detail but it will all pull together and reward you in the end if you stick with it.